This bread got so many ooohs and ahhhs when I served it that I wanted to collect them in a jar and use them as currency somewhere! Hmm, now what country accepts VISA, Mastercard, and Ooohs and Ahhhs??? The most amazing thing about this bread is how fun and easy it is to make. 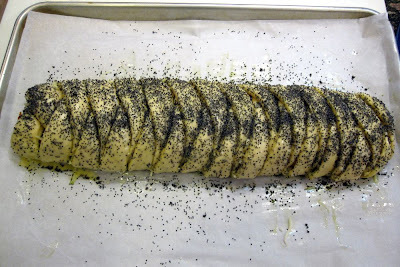 In fact, I made one with poppy seeds on top, and then immediately started working on a second loaf that I'd top with sesame seeds. 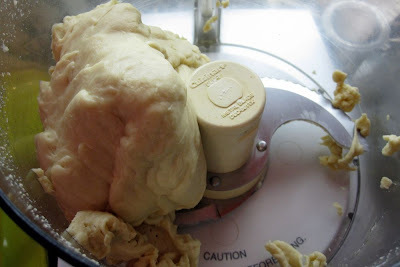 Believe it or not, you prepare the dough in a food processor! 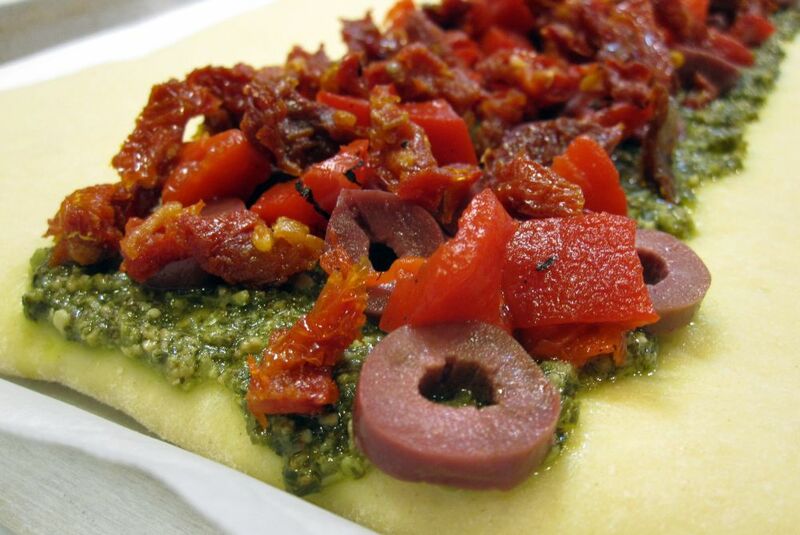 Everything from mixing to kneading happens there, so it comes together really fast. This is the kind of bread you could personalize, customize, redesign with ingredients you have in your pantry. 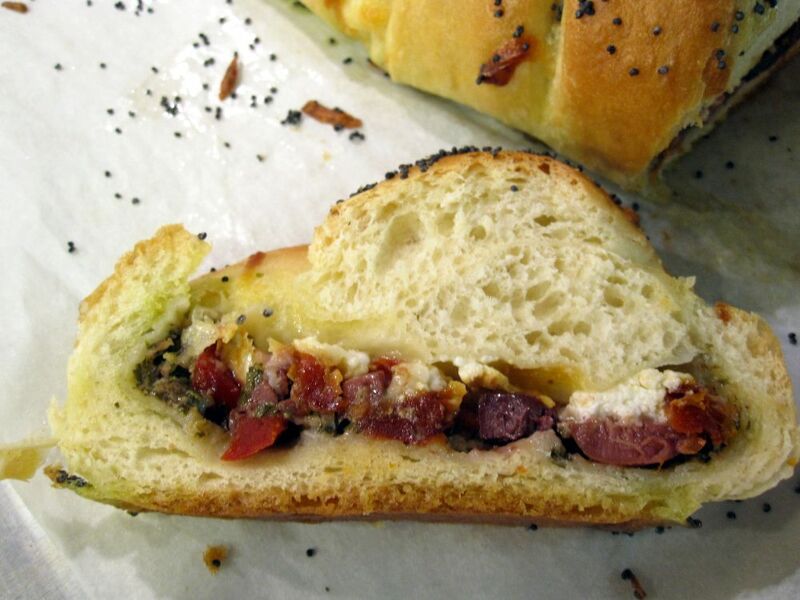 If you don't regularly stock olives and sun-dried tomatoes, try artichoke hearts or skip those ingredients completely. I was even thinking it would be fun to use this dough with a pizza filling, so instead of pesto, spread pizza sauce on the bottom, then layer with cheese and pizza toppings. And once you learn the braid technique, you'll want to use it on all sorts of other bread recipes. 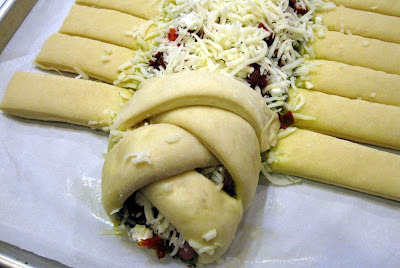 It's more like a mock braid because you don't lift up strands and actually braid them; you simply slice the edges of the dough lengthwise on each side of the filling and fold the flaps over to cover the filling. The result is gorgeous. I'm going to have to say it is one of my favorite things I've ever made in my entire life. Trust me; that is a VERY strong statement. Enjoy! Fill a large shallow pan or roaster half full of water and bring to a boil (or pour boiling water in the pan). This will be used for rising. Set aside. 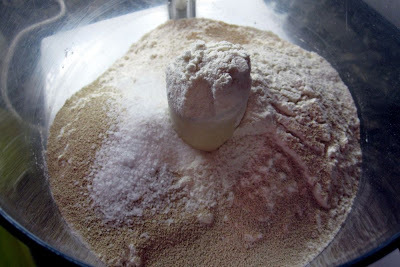 In a food processor fitted with the metal blade, combine flour, yeast, sugar, and salt. Pulse for a few seconds to combine. 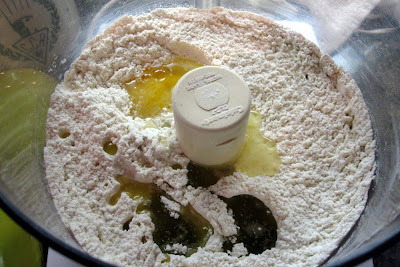 Add the oil and egg and process until well combined. Turn the motor on again and use the pouring spout on the lid of the food processor while you slowly drizzle the water into the dry ingredients. Don't add too much water. It's possible you won't need the full amount called for, so to be on the safe side, check the dough before you add the last 2 tablespoons of water. 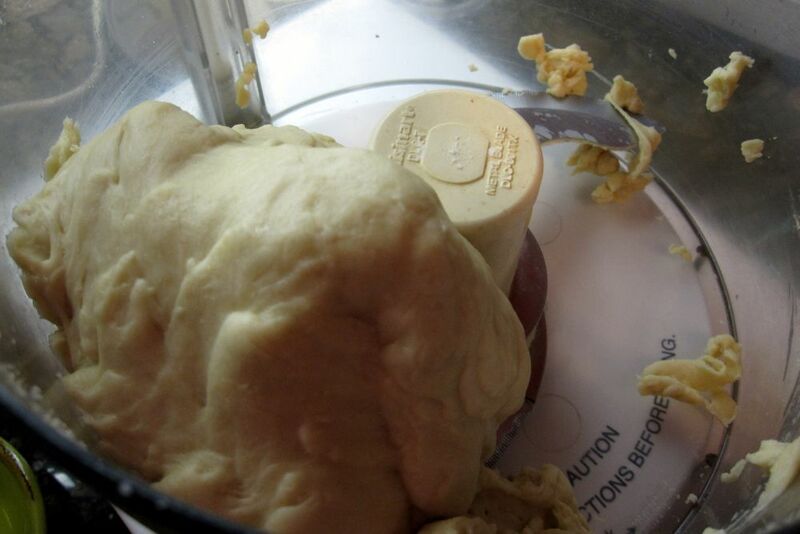 You'll know the dough has enough water when it pulls away from the sides of the bowl and forms a ball. If it doesn’t form a ball yet, add a very tiny bit of the reserved water until a ball is formed. To knead the dough, simply process for 60 seconds. So easy! 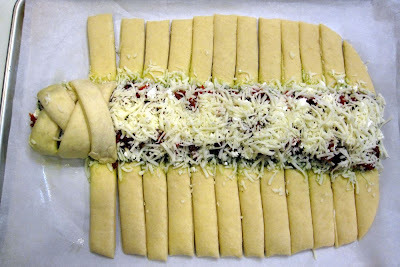 Let the dough rest in the bowl, covered with a towel, for at least 10 minutes. Meanwhile, use this time to prepare the filling ingredients. I like to have all of the toppings chopped and measured out and placed in little ramekins so I'm ready to go for assembly. 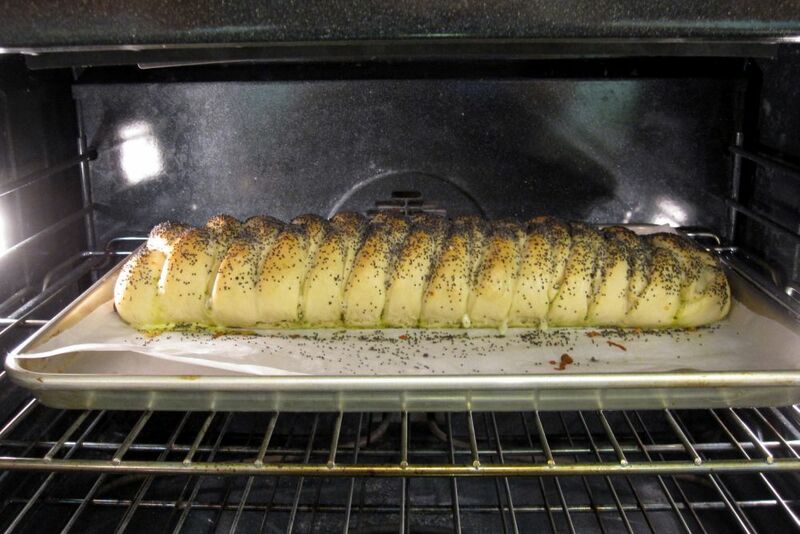 Measure a piece of parchment paper that will fight onto your baking sheet. 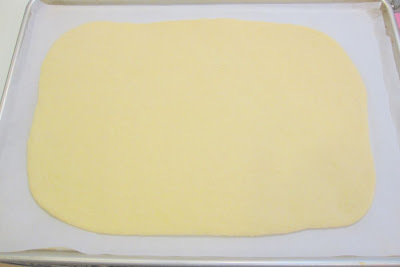 Place this parchment paper on your dough board and lightly flour it. 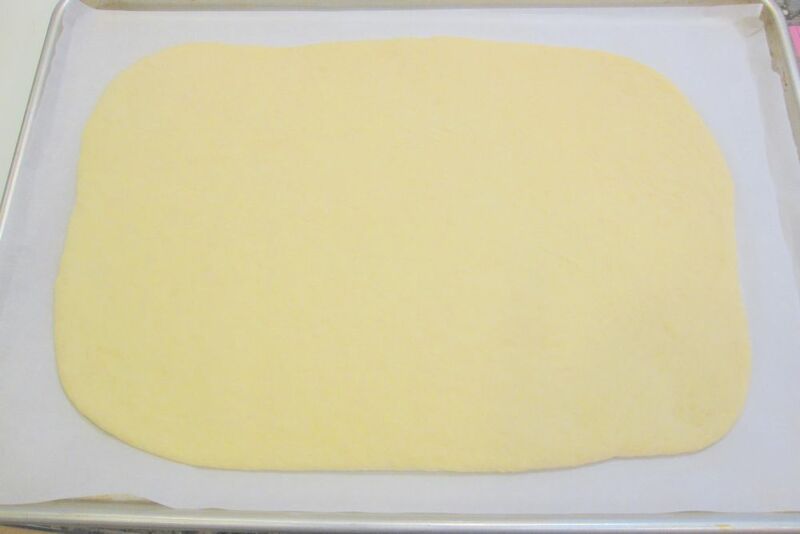 Roll the dough into a 14x10-inch rectangle. Use a ruler to mark where the center third of the rectangle is. 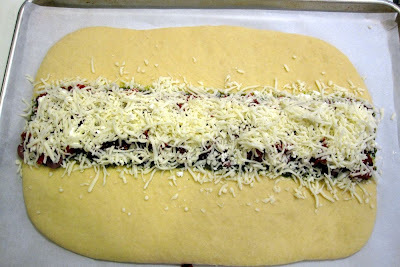 Lightly press the ruler or a dough scraper down into the dough to mark the area. 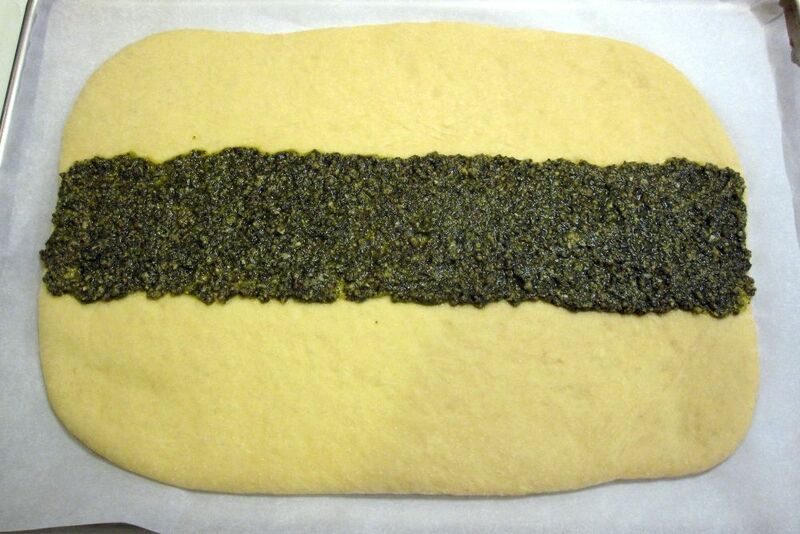 Spread pesto lengthwise down this center third of dough. Sprinkle with olives, cheeses, red peppers, and tomatoes. You can add these ingredients in any order. I put the cheese on last. Using a ruler, make cuts at 1-inch intervals from filling to edges of dough. Since it's a 14-inch long rectangle, that means 14 strips of dough on each side. 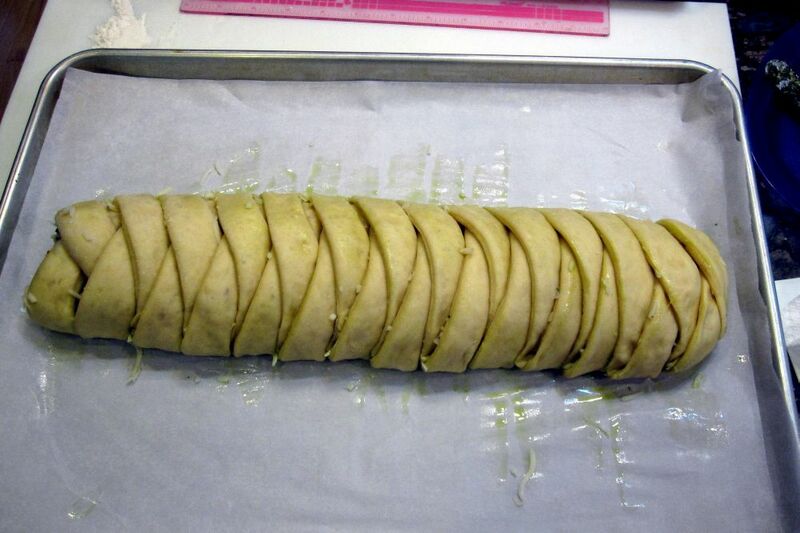 At this point, transfer the parchment paper with the dough on it very carefully to the baking sheet. 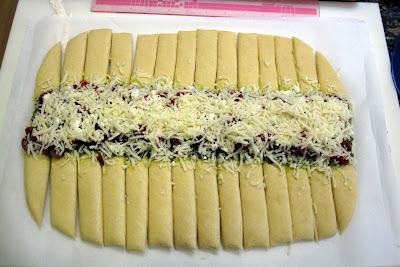 Alternating the sides, fold strips at an angle across the filling. I used a bit of the oil from the pesto to wet the end of each strip so it would stick to the other side. That's really not necessary; I was just paranoid. 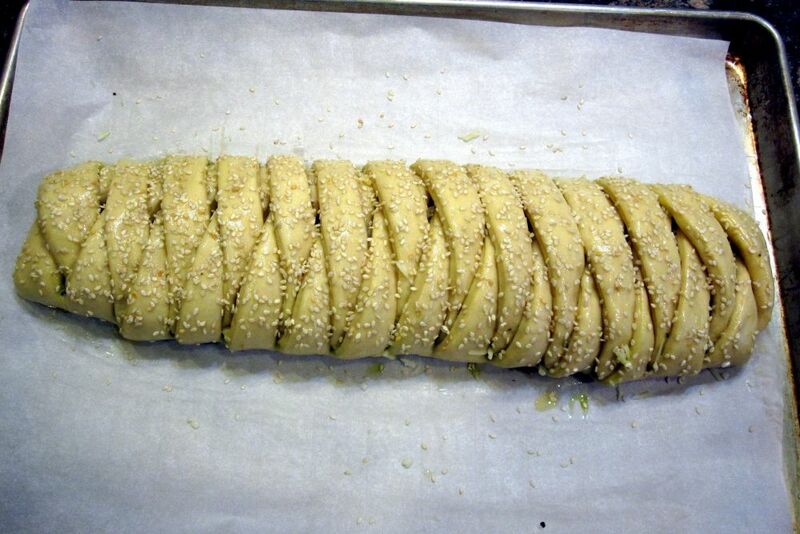 Cover the braid with a towel. Prepare the oven for baking by placing the rack in upper third of oven. 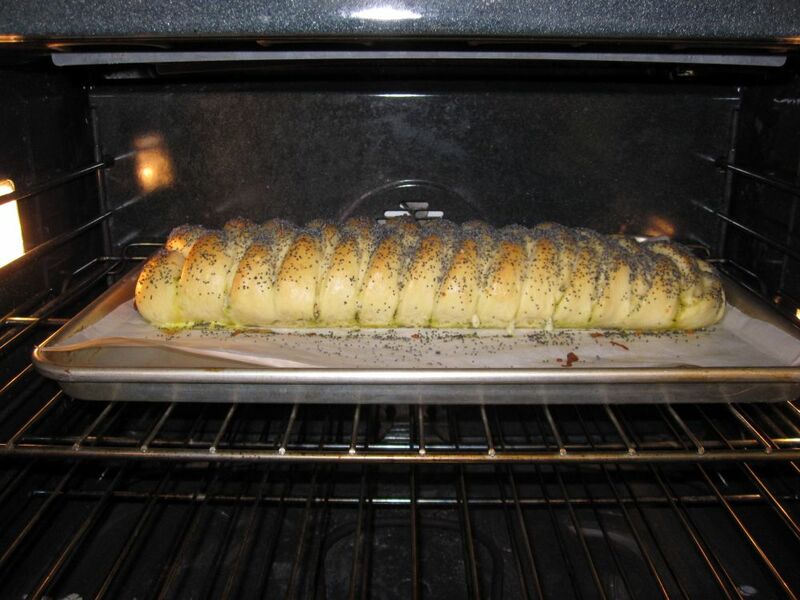 Preheat oven to 400 degrees F.
To rise: Remember the pan of boiling water you prepared at the beginning? 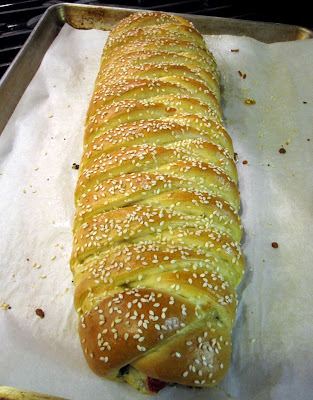 Place baking sheet with bread over pan. Let rise 15 minutes in this warm position. 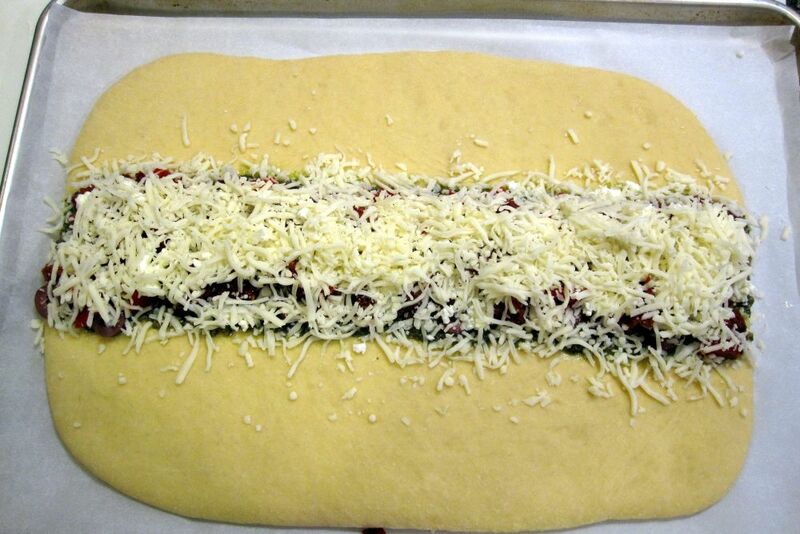 It will begin to swell like a pizza crust. To bake: Brush the egg glaze over loaf and sprinkle with seeds, if desired. 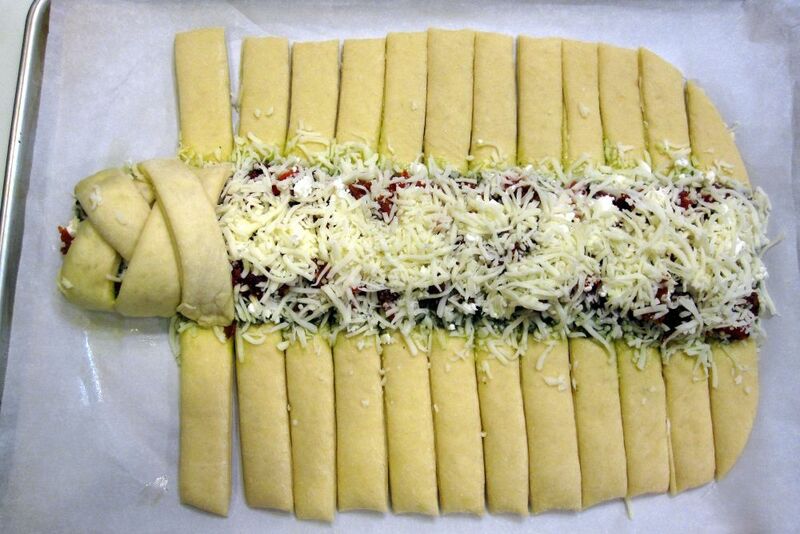 Bake for 15 to 20 minutes, or until golden. Tap the bottom of the loaf with your finger to listen for a hollow sound; it's done when it sounds hollow. 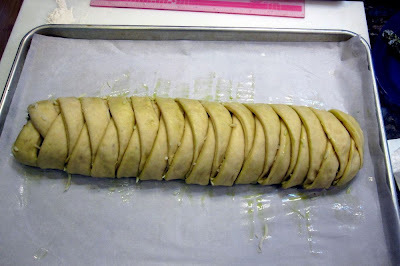 Transfer to a cooling rack and allow to cool for 15 minutes before slicing. Serve warm or at room temperature. 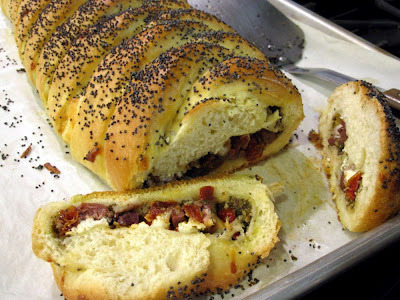 You can make this the day before and keep the loaf in the fridge overnight. Just reheat at 350 degrees F for about 10 minutes before serving and it will be as good as new! 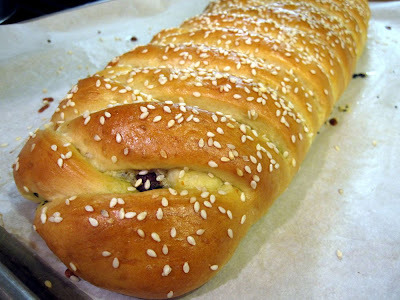 I almost forgot that you had made that bread! 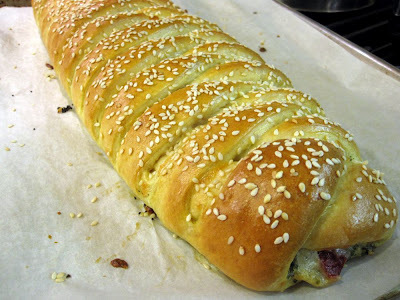 So glad you wrote about it because it is so easy, unique, and delicious. I would definitely make that for guests! As usual, I love your pictures - I want to eat them right off my monitor!! 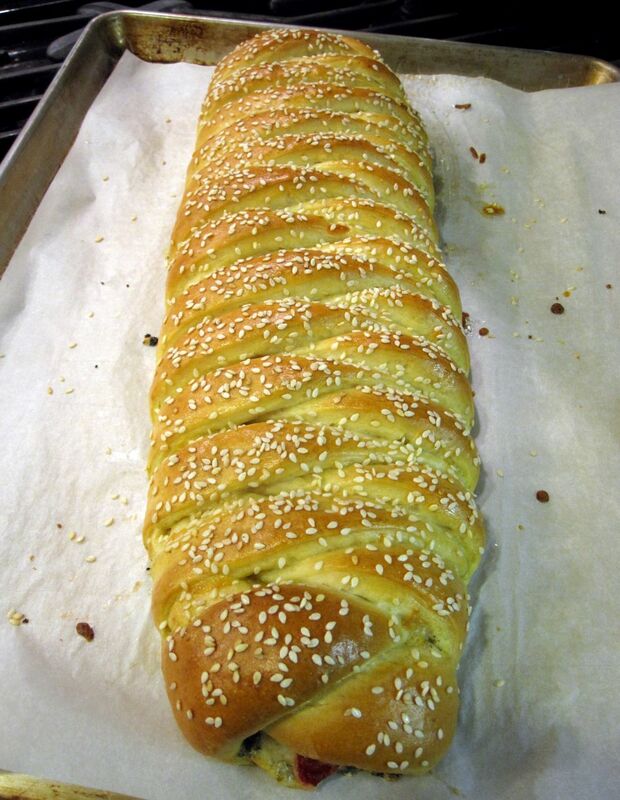 I swear, you make THE most beautiful breads. 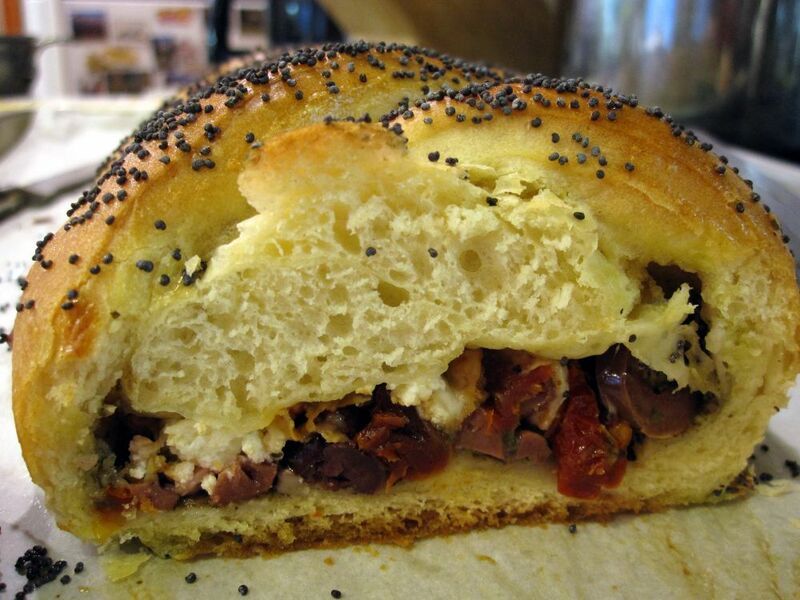 First, that challah, and now this lovely one with my fave Italian flavors. Yum!